SAN DIEGO (AP) - The Obama administration plans to spend more than $400 million to upgrade ports of entry and surveillance technologies to help thwart drugs and arms smuggling along the U.S-Mexico border. 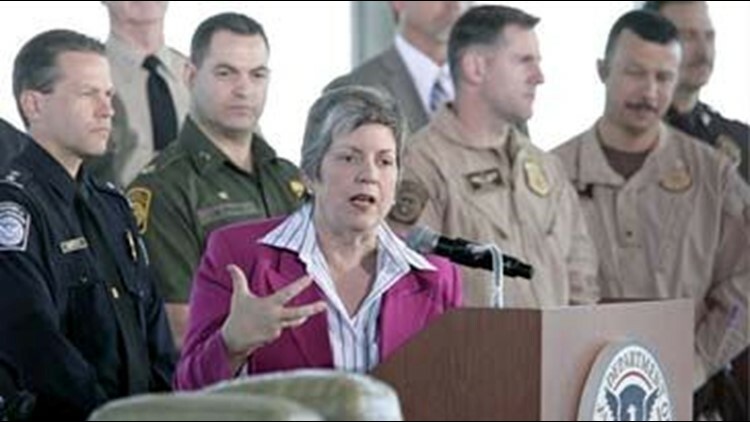 Homeland Security Secretary Janet Napolitano said Wednesday that the projects will help keep violence from spilling across the border. "Working together at all levels, we take them on and we take them out. That is our goal," Napolitano told reporters after an aerial tour of the border area near San Diego. From the air, Napolitano could see smugglers' paths worn into the rugged terrain of the Otay Mountains that hug the border. In her first visit to the U.S.-Mexico border since taking office two months ago, Napolitano toured a customs and border protection facility at Otay Mesa, Calif. The spending outlined by Napolitano is part of President Barack Obama's economic stimulus package approved by Congress. Included in the border spending is $269 million to upgrade ports of entry, including San Diego's Otay Mesa - a busy crossing for trucks - Antelope Wells, N.M., and Nogales, Ariz. The plan calls for $42 million for high-tech inspection equipment and $50 million for a high-tech surveillance systems along Arizona's border with Mexico. Napolitano said additional cameras would be mounted at the Otay Mesa facility to record vehicle traffic heading into Mexico, a tactic expected to help cut into the smuggling of guns from the United States into Mexico. The U.S. Bureau of Alcohol, Tobacco, Firearms and Explosives reports that up to 95 percent of guns seized at scenes of drug violence in Mexico can be traced to U.S. commercial sources. These weapons are increasingly higher-powered, including .50 caliber rifles and armor-piercing ammunition. To help curb southbound arms trafficking, the Mexican government plans to begin checking more vehicles crossing from the U.S. At present, Mexico checks about 10 percent of the 230,000 vehicles that cross the border each day, according to the federal Attorney General's Office. By weighing vehicles for unusual heaviness and tracking license plate numbers, the two government hope to catch more hidden contraband. The United States has long weighed and checked the license plates of northbound vehicles, but not if they are southbound. Napolitano said that practice is changing with the installation of surveillance cameras at Otay Mesa and other border crossings. The Obama administration announced last week that nearly 500 more federal agents are being deployed to the border, along with X-ray machines and drug-sniffing dogs, both to stop the spillover of Mexico's drug violence and curb gun smuggling. Drugs and arms smuggling and drug cartel violence are the topics of a meeting in Cuernavaca, Mexico, on Thursday. Attending are Napolitano and U.S. Attorney General Eric Holder and Mexico's Attorney General Eduardo Medina-Mora and Interior Secretary Fernando Gomez-Mont. Meanwhile, in Washington the Senate approved legislation to authorize an additional $550 million over the next five years for federal agents, investigators, and other resources to help fight Mexican drug cartels blamed for a wave of violence along the border. Lawmakers said the money would help stem the flow of drugs northward over the Mexican border and the flow of guns and money southward into Mexico.